Over the years, I have tried diet after diet and fad after fad to try to help me lose weight. After nearly 30 years of personal research and trial and error, I’ve discovered that the only way to lose weight and keep weight off is through healthy eating, portion control, and exercise. However, for those of us who have a job outside of the home, work can prove to be quite challenging on the diet and exercise front. The following tips may help you stay on track with your healthy eating and perhaps even give you a few extra steps to log for the day or the week. Brush your teeth to stop mindless munching. We all get bored during work at one point or another, and sometimes we reach for those oh-so-convenient snacks in the machine because we think we’re hungry. Or we think we need some energy. Try brushing your teeth first and foremost when you start to get bored. Who wants to eat a gooey candy bar right after brushing their teeth? Not me! I like the feeling of clean teeth and minty fresh breath! Eat a high protein, low sugar breakfast. Obviously it’s important to eat a healthy breakfast as eating breakfast means no snack attack mid-morning. And if the breakfast is high in protein, it will stick with you longer. I have a serving of oatmeal with peanut butter and a sprinkle of flax seed and nuts (pecans, walnuts, whatever floats my boat), no milk, no sugar… this will last me 3 to 4 hours if all I’m doing is sitting at my desk. Park as far away as you can from the building. Want some extra steps to log for the day? Park as far away from your office building as you possibly can. If you wear heels, bring walking or running shoes to cover the distance. Who knows! You might get an extra 2000 to 4000 steps a day (approximately 1 to 2 miles), or 10,000 to 20,000 steps per week (approximately 5 to 10 miles). And you might appreciate that little 5- to 10-minute walk right after work to detach from your busy day! Stay hydrated. Keep a bottle of water at your desk to sip on regularly. Once you’ve reached the stage that you’re actually thirsty, you’ve gone too long without water. If you don’t like plain water, try some homemade fruit-infused water instead. Add strawberries, lemons, mint, cucumber… anything to make it taste yummy. Another trick to try is to drink a half or a whole cup of water before each meal or snack. Not only will this hydrate you, you’ll feel fuller faster. Take a walk. When you’re feeling tired or bored at work, get up, take a break, go outside for some fresh air, and walk around the building. Guaranteed to leave you feeling refreshed and more awake. And if you’re able, try to squeeze in a quick walk after you eat your lunch. You’ll feel better in the afternoon, and you’ve just added more steps to your step counter! Score! Keep healthy snacks handy. Never leave anything to chance and always plan ahead. There are going to be times when you will absolutely need a snack. 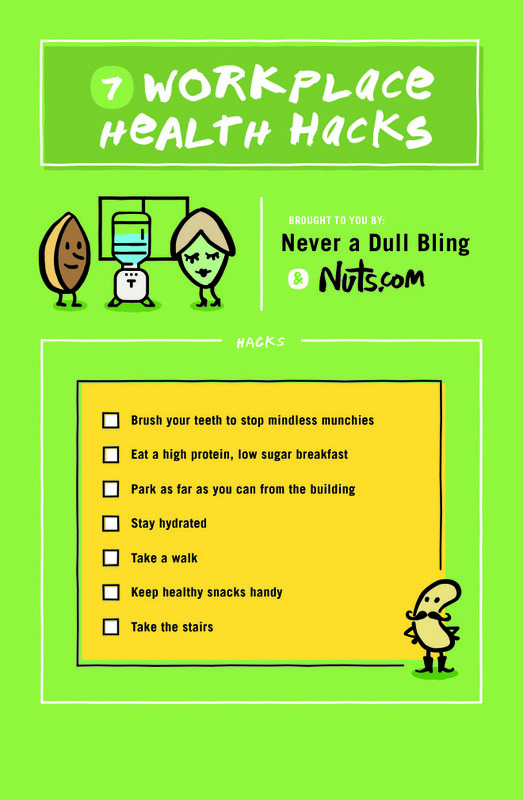 To avoid the snack machine sabotage, keep a healthy snack within reach, just in case. For some great healthy snack ideas, I found that Nuts.com has some great options on their Healthy Snacks page, all for about 160 calories or so. Having had hypoglycemia (low blood sugar) my entire life, I need to have a snack with me at all times, and my snack of choice usually includes nuts or peanut butter. 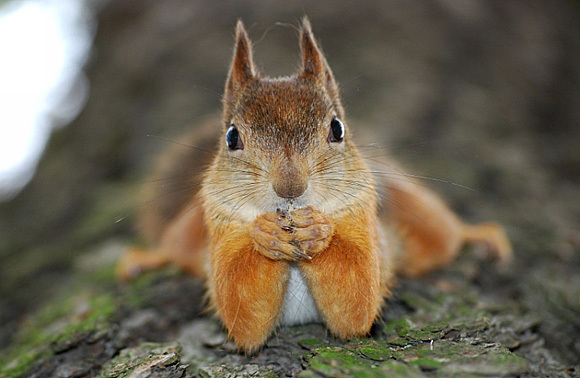 I need the high protein that nuts have in order to keep my blood sugar level. Take the stairs. If I had stairs in my building, I’d run up and down one level every hour! What a great way to re-energize and get a quick workout in! So what if you’re on the 6th floor! If you start taking the stairs on Monday instead of the elevator, think of how much more fit you will be in 1 month! Again… wear running or walking shoes to make those extra steps a bit more comfortable! It’s important to plan ahead and to just keep moving! Take control of your health and diet at work… don’t let it control you! This entry was posted in Diet/Eating and tagged diet, exercise, food, healthy snacks, nuts, nuts.com on February 6, 2016 by Paula. I love this article! Thanks for writing it! I have been struggling to fit healthy nutrition in with my work schedule and these suggestions are so helpful. I am going to try your morning oatmeal recipe for sure! Thanks again! Xoxoxo. Perfect timing! Work has certainly made healthy living challenging for me this past week! This is great Paula….I’m one of those people guilty of trying to find a parking space close to the door at the gym. Lol…although it’s been awhile since I’ve been I definitely have been taking advantage of the stairs at home and walking in the nice weather we’ve been having. Will definitely be stepping it up sooner than later!! I used to do that too, lol!! I always parked as close to the front as possible! But now with all the step trackers, it’s kind of fun meeting the daily goals, so however you can get those steps in, haha! You are so lucky with your nice weather!! We’ve been kind of rainy but I think we’re actually going to be near 60 tomorrow!! (We’ll see, lol) Have a great night Tasha!! Good ideas that I used to follow and had kind of stopped doing. Since I’m seeing a personal trainer I’m going to go for it and try all the small tricks. Thanks! Awesome!! Every little bit helps!! Good luck to you!! Some great tips in here! As someone who struggled with weight loss for years also, I completely agree with the only way is healthy eating and exercise, it sure can be hard to maintain though! This is very useful. To keep to losing weight is one of the toughest trials ever. Thank you Jacqueline! (Your comment ended up in my spam somehow! Silly spam!) Yes, it is extremely hard! And a daily battle at that!! Actually, most people in my WW meetings think it’s easier to stay on plan at work than at home! It’s been 20+ yrs since I worked outside the home, though (worked from home quite a while) so I wouldn’t know! I think the protein with breakfast, hydration, and little bits of movement throughout the day are so important — whether you are at home or work! You’re so right Judy! It’s important no matter where you are!! I was a transcriptionist working from home for over 12 years. I definitely found it easier to move and take breaks than being at an office, but then that opens up the whole pantry, doesn’t it! Pros and cons of both in and out of home, I guess, lol!! Very amazing tips and lots of inspiration Paula! Awesome post! Such nice tips to think about Paula!!!! Love all of these tips and can’t agree with them more! I take the train to and from work and have to walk a mile each way on top of that– so that helps me stay on track (apart from all of the walking). Staying active but also listening to these tips throughout the day is the key to a healthy lifestyle! 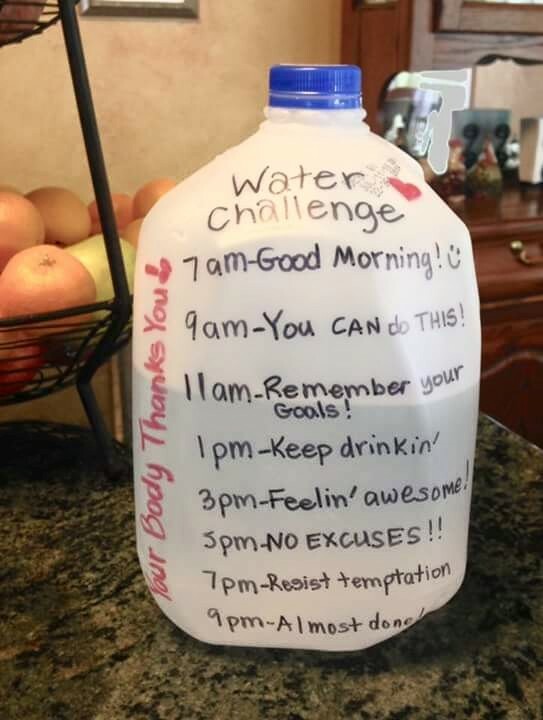 The marked bottle of water … cute and clever idea !!! I used to keep numbered counters on the water dispenser, moving them out each time I take a glass. This one is a visible reminder which I shall adopt. Great post.